Includes 1 Year Free Extended Warranty. 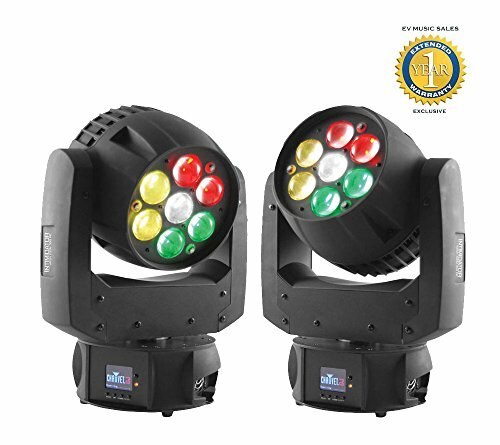 The Intimidator Wash Zoom 350 IRC is a bright and powerful, LED moving head wash light that gives you a variety of rich and saturated colors with or without a DMX controller. In Master/Slave mode it gives you a dynamic light show quickly and easily. The motorized zoom, strobe, and color change programs are easily selected from the control panel or with the optional IRC-6 wireless remote. The Intimidator Wash Zoom 350 IRC has a fast and smooth movement for unparalleled excitement or subtle motion effects. If you want to take your show to the next level, use a CHAUVET DJ DMX controller! The Intimidator Wash Zoom 350 IRC travels best in the stylish, optional CHS-50 VIP Gear Bag. View More In Projection Effects. If you have any questions about this product by Chauvet, contact us by completing and submitting the form below. If you are looking for a specif part number, please include it with your message. Chauvet DJ Core Par 80 USB Stage Par Light COREPAR80 FX+D-Fi USB + Free Speaker! Chauvet DJ Gobo Zoom USB Custom Gobo Projector Light W/10 Gobos + Free Speaker !